The Gear Oil pump articles provides guidance and review about different types, qualities, durabilities, and prices. This is used to transfer the fluid by the gears. The oil is transferred through the meshing gear arrangement in the vanes. Gear oil pump transfers oil by the means of displacement. These pumps are used to transfer the fluids such as gear oil, transmission fluid, steering fluid, hydraulic oil and compressor oil. The gears rotate and separate at the inlet end, creating a void. The void formed helps in the suction of the fluid. The rotation of the gears with small clearances causes the fluids to flow. The fluid flows through the gears and is transferred to the other end of the pump. Gears have a mechanical clearance of range 10 μm. Gear oil pumps are mainly used to pump the high viscous fluids such as oils, etc. Gear pumps are designed to operate in extreme conditions such as the high discharge pressure, temperature and with more viscous fluids. They are rugged in construction. A gear pump is selected depending upon the various performance parameters, physical, chemical factors that affect them. The proper selection of the gear pumps will ensure a smooth and trouble-free operation of the gear pumps. Type of pump – We must decide the type of pump to be used such as the external gear or internal gear pump. External gear pumps are used in high flow rate and high-pressure conditions. 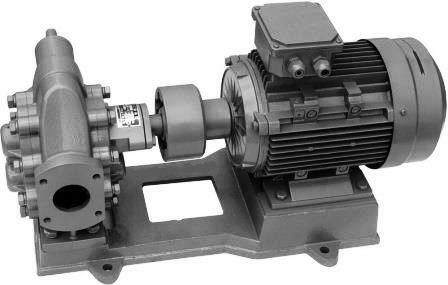 Internal gear pumps are used for low speed and low-pressure conditions. Internal gear pumps are present with a crescent-shaped structure inside them to improve the performance while pumping the highly viscous oils. Flow rate – the amount of oil to be pumped in certain time. It is expressed in terms of volume per unit time and measured as Gallons per hour (GPH). Viscosity – Viscosity is the resistance to flow. The viscosity of the oil must be considered for the continuous and smooth operation. Lubricant type – Due to the mechanical motion in the pumps we must choose a suitable lubricant. Lubricants dissipate the heat formed and avoid the wear and tear problems. Lubricants must also possess suitable viscosity properties to flow easily over the gears. They should not contaminate the oil flowing through the pump. Power – the amount of power required for the operation of the pump. Power is expressed in terms of Horse Power (HP). The pumps are powered by the various power sources such as electrical, hydraulic, and solar. Material – we must also consider the gear, casing and other component materials that come in contact with the oil transferred. They must be resistant to the abrasion and corrosive properties of the transfer medium. Ability to produce the high discharge pressure of 5000 psi. Excellent control of the flow rate and volume. They are used as metering pumps. Can also withstand the high-temperature conditions up to 700 deg-F.
Used to transfer high viscous fluids. They are bi-rotational so the discharge end can be changed. Cannot be used with the solid particles suspended. Solids affect the gear rotation. Fixed clearances must be maintained between the gear and the casing. Bushings are required for the smooth operation. Gears must be manufactured precisely and are expensive. They are used as the oil pumps in the engines for supplying the lubricating oil and cooling purposes. They are also used in the automatic transmission systems, semi-automatic clutches, power steering and propulsion systems. In Petrochemical industries, they are used for the transfer of crude oil, diesel, etc. In the food industries, they are used for transferring oils, butter, vegetable fats and similar highly viscous foods. Used in the paper and pulp industries, soap, latex and chemical industries. Some of the predominant gear oil manufacturing companies are Adroit Pumps, Honor Pumps, Rotofluid Systems, American-marsh Pumps and Ampco Pumps. Gear oil pumps price depends upon their size, power, application, etc. Small gear oil pumps are used in the brewing and food industries and may cost around 200$-500$. Gear oil pumps are used for large flow rate applications and cost around 2000$ to 5000$. Pumps used in the petrochemical industries and vehicles are custom designed according to their needs. American-Marsh Pumps are one of the oldest pump companies in America established about 100 years ago. They manufacture all kinds of pumps from the centrifugal to the screw pumps. They mainly concentrate on the industrial, commercial, municipal and fire-protection service applications. Ampco Pumps are one of the leading pump manufacturer and maintenance companies. They mainly concentrate on the marine, sanitary, brewing, blending and mixing industries. They also sell the replacement parts for the pumps. They have authorized service centres to assist in the service and repair of the pumps. Honor Pumps are one of the fast growing pump industries. They manufacture high-pressure gear pumps. They mainly manufacture pumps of smaller sizes for domestic purposes and small-scale industries.